Create a Memorable Setting with Table Decor International! Table Decor's Chandelyn table lamps create an environment, a mood, and a warmth that adds dimension and intimacy to a restaurant setting and make an unforgettable statement.
" A beautiful table is enhanced with the appropriate table lamps. 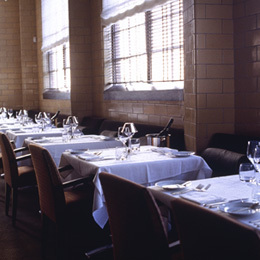 Table Decor has been our choice since the inception of our restaurant." Since 1984 we have supplied many fine hotels, restaurants, clubs, resorts, casinos, inns, and cruise ships with just the right table lighting to create this atmosphere that will keep your customers coming back. Many of our customers that started with us then are still customers today ... the products add ambiance to their decor and work well operationally withstanding the rigors of foodservice use. Our customer list includes other accounts such as The Ritz Carltons, The Greenbrier, Four Seasons, The Broadmoor, The Breakers and many others. Great designs to fit any decor from bistro settings to fine dining. Proper sizing means our lamps are designed so they are not too tall to impede conversation, or they are tall enough so you can see under them on a banquet table. Durable, weighted lamp base castings are designed so they will not easily tip, yet the base "footprint" is sized so that it does not take up a lot of room on the table. Shades are handsewn of flame-retardant fabrics that meet a commercial fire code. Fabrics are carefully chosen for their attractive designs and ability to let light through the fabric for a romantic, flickering effect. Because we make our own shades, we are also able to manufacture using custom fabrics or trims when the customer wants something unique, without a long lead time, huge expenses or large minimum orders. We offer many lighting choices for your lamp. 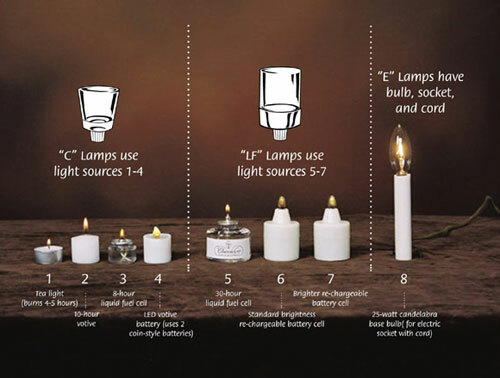 Customers can choose to have their lamps made to use candles, liquid fuel cells in different sizes, batteries (rechargeable or coin-style), or we can even drill and wire a lamp for electric use. Many other table lamp companies are trying to only sell their fuel products and don’t focus on the quality of the fixture. We think the lamp is what will capture your customer’s attention and add that memorable ambience to your tabletop; we make our lamps to use the type of light source that suits your operation. Beautiful finishes - our brass is solid brass with a lacquered finish, silver is a hotel quality fine silverplate, crystal bases are 24% lead crystal; antique finishes are either an antique plated finish or a hand-painted faux finish with a protective topcoat. We also offer nickel and satin pewter (which don’t need polishing). These quality finishes are apparent to your customers and you will appreciate the quality as your staff handles the products. Our café lights are a wonderful, more informal light with the same commercial quality standards and unique designs to upgrade your table and bar areas! Our tabletop accessories will add creativity to your tabletop and serving areas. Salt and peppers, vases with flowers or vase only have unique designs and finishes to set your tabletop apart! We recently sold many copper topper finish salt and peppers and matching sugar packet holders through Fellers Fixtures to College of the Ozarks in MO to accent their fine tabletop designs. 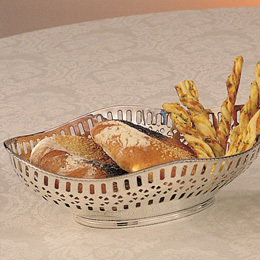 Buffet serving pieces are unique, elegant, well priced… and durable.After we supplied elegant silver lamps for the main dining room at The Carlyle Hotel in NY, they also use our 6546AS silver buffet footed bowl as an elegant serving piece for their breakfast buffet. 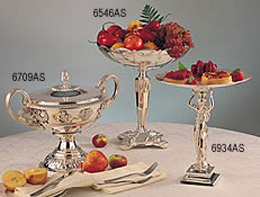 Wine coolers and stands are available in silverplate or nickel finish with several unique designs.